The gears of impeachment are turning. What's the Dem endgame? Home Politics The gears of impeachment are turning. What’s the Dem endgame? The gears of impeachment are turning. What’s the Dem endgame? For House Democrats, impeaching President Donald Trump is both inevitable and impossible. Democrats anticipate they will gather plenty of evidence of high crimes and misdemeanors on the president’s part, but they’re torn over what to do with it — fearful that their efforts will backfire and end up helping Trump. “You don’t want to divide the country, so you have to think you have such a case that once the case is finished being presented, enough people understand you had to do it,” House Judiciary Committee Chairman Jerry Nadler (D-N.Y.), whose committee has the power to launch impeachment proceedings, said in an interview. 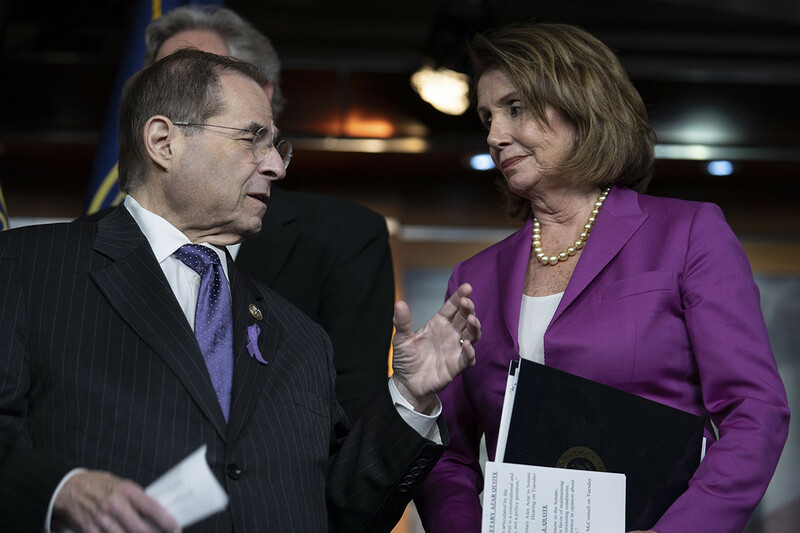 While Nadler cautioned that his standard for impeachment “doesn’t mean you have to have Republican votes,” he said Democrats need to win over at least some voters who backed Trump in the 2016 election — a difficult feat for Democrats as Republicans have remained loyal to the president and have largely backed his criticisms of special counsel Robert Mueller’s investigation and other probes ensnaring the president and his associates. “[Mueller], plus the hearings we have, might produce enough information where some people will open their minds — but right now, a can opener couldn’t get ‘em open,” Rep. Steve Cohen (D-Tenn.), a senior member of the Judiciary panel, said of Republicans. That reality underscores Democrats’ conundrum as they interview witnesses and demand documents as part of the sprawling oversight arsenal they’ve set into motion. Interviews with more than a dozen key Democratic lawmakers revealed deep divisions within the caucus about whether their efforts could end up helping Trump win a second term in office. They’ve set the bar for impeachment so high that lawmakers are skeptical that removing Trump from office with bipartisan support would be achievable, leaving many Democrats pondering their endgame. For that reason, Speaker Nancy Pelosi (D-Calif.) and committee chairs have broached the impeachment topic cautiously, arguing it should be considered only after the various federal and congressional investigations of the president are complete. A notable exception is Rep. Maxine Waters (D-Calif.), who chairs the House Financial Services Committee and has said there is already enough evidence to impeach Trump. But even as senior Democrats resist the prospect of impeachment, demands from the caucus’ progressive wing and liberal grassroots groups to remove Trump from office are only rising. Pelosi will come under enormous pressure if the committees uncover sufficient evidence of wrongdoing. But Democrats are torn over whether they should rely on Republicans and risk an uproar from their left flank, or impeach Trump in the House and risk the political backlash. Rep. David Cicilline (D-R.I.), a member of the Judiciary panel, said Democrats would have “no choice” but to impeach Trump if the evidence is sufficient. Privately and in public, Democrats acknowledge it’s all but inevitable they will reach that stage. “When we get to that point, it’ll be time to move — assuming that the facts lead us to that conclusion, which I suspect that they will. And many agree with me,” said Rep. Hank Johnson (D-Ga.), a senior member of the Judiciary Committee. But Pelosi and her allies have argued they can move forward with impeachment only when public opinion turns against Trump in such a way that it’s no longer politically advantageous for Republicans to stick with him. “You have to think, at the beginning of the process, that the evidence is so stark, the deed so terrible, that you believe that once it’s all laid out, then you will be able to get an appreciable fraction,” Nadler said, warning that Democrats should not risk being accused of subverting the will of the people. “If you do it, you don’t [want to] have half the country saying for the next 30 years: We won the election, you stole it,” added Nadler. At least 20 Republican senators must flip in order to secure a conviction. Without them, some Democrats caution, impeaching Trump in the House is fruitless and could deliver the president a political gift ahead of his reelection. Democrats remain under intense pressure from outside liberal groups and a small faction within their own ranks to begin impeachment proceedings immediately — especially after Michael Cohen, in public testimony to the Oversight Committee, implicated Trump in a criminal conspiracy surrounding hush-money payments to an adult-film actress. The Judiciary Committee also recently launched a sweeping probe into allegations of obstruction of justice, corruption and abuses of power — all of which could be impeachable offenses. Rep. Rashida Tlaib (D-Mich.), a member of the Oversight Committee who famously vowed on her first day in office to “impeach the mother——,” has said she plans to introduce articles of impeachment against Trump. But Pelosi and her deputies have pushed back on those efforts, calling impeachment a “divisive issue” as they lean heavily on the ongoing federal and congressional probes. Meanwhile, liberal billionaire Tom Steyer is targeting House Democratic committee chairs in their own districts, holding town halls and running ads encouraging them to begin an impeachment inquiry. But even the more progressive congressional Democrats have resisted Steyer’s efforts, warning that an impeachment process will likely tear the country apart without irrefutable evidence of wrongdoing. “The thing that hurts is there are a lot of people who have already decided he is a criminal. And sometimes I feel like that’s been normalized a little bit,” added Rep. Pramila Jayapal (D-Wash.), a member of the Judiciary Committee and a co-chair of the Progressive Caucus. Republicans are basking in what they view as a Democratic Party tearing itself apart over impeachment, an issue they hope to use against Democrats in the run-up to the 2020 election. They have accused Democrats of launching fishing expeditions aimed at avenging Hillary Clinton’s defeat to Trump in 2016, and pleasing a progressive wing that’s eager to see the president thrown out of office right away.